In this Nov. 28, 2017 photo, an aerial view shows sinkholes in the abandoned tourist resort of Ein Gedi on the Dead Sea shore. 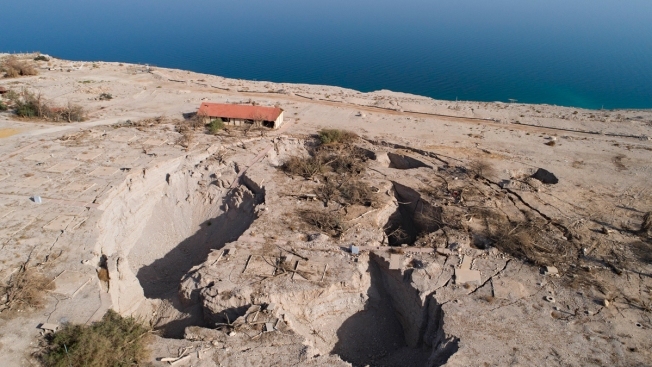 The Dead Sea, which lies between Israel and Jordan, is retreating by more than three feet a year, creating sinkholes that swallow up buildings and roads, and causing upheaval in tourism industry, NBC News reported. Damming and mineral extraction have contributed to the decline, along with evaporating seawater. A $1.5-billion project to build a desalination facility in Jordan aims to transform Red Sea water into drinking water and pump the remaining salty brine into the Dead Sea. The best-case scenario would see construction begin in early 2021 and take around three-and-a-half years to complete. Click here for more information on why the dead sea is dying and efforts at a solution.